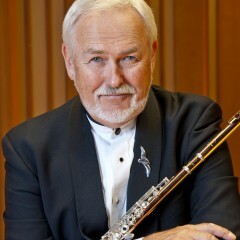 Jim Walker became principal flutist with the Los Angeles Philharmonic and began working simultaneously in the recording studios for jazz/pop sessions, television and motion pictures and can be heard on over 600 sound tracks. Jim Walker, professor of practice, winds and percussion, graduated with honors from the University of Louisville and went on to play in the United States Military Academy Band at West Point. He subsequently studied with Harold Bennett and eventually won the associate principal flute position with the Pittsburgh Symphony in 1969. Eight years later he became principal flutist with the Los Angeles Philharmonic and began working simultaneously in the recording studios for jazz/pop sessions, television and motion pictures and can be heard on over 600 sound tracks. In 2002 he performed with Paul McCartney at the Academy Awards. In 1980, Mr. Walker formed Free Flight, a jazz/classical quartet, resulting in four Tonight Show appearances, 16 recordings and annual tours.